Roof East rooftop venue returns for winter with better than ever Sliders Curling, Igloo dining experience and throwback neon Ski Lodge Bar from 2nd of November 2017. The summer of 2017 saw the venue go for gold once again; Roof East played host to some of the best bowling, batting, golfing and roller skating London has ever seen. Sliders – bowling’s wonderfully weird winter cousin - is back at Roof East - bigger and better than ever. 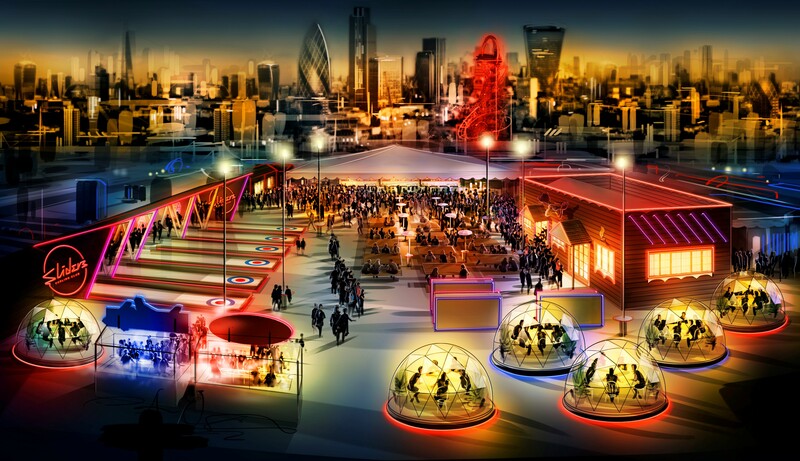 Due to popular demand, London’s only rooftop curling experience now has six lanes all complete with glowing neon theme and the 80’s neon retro-chic Ski Lodge Bar. Roof East is managed and operated by Urban Space Management Ltd.